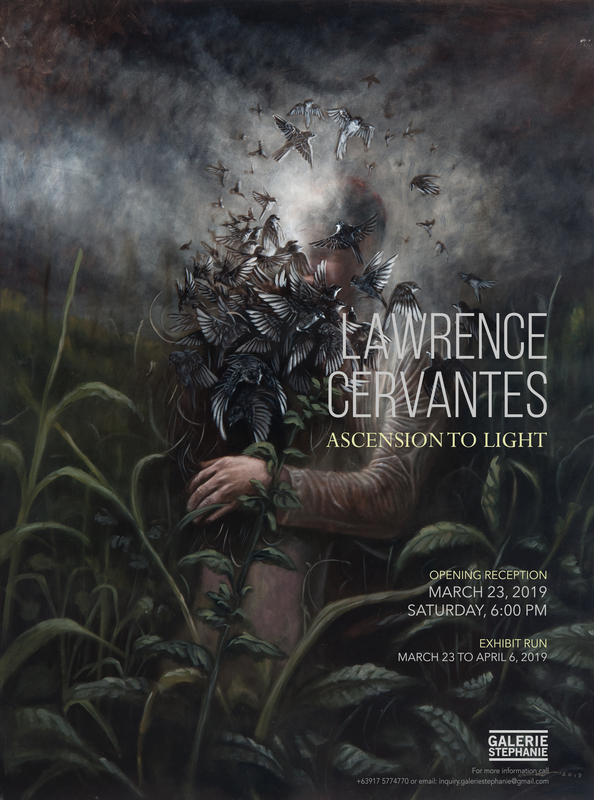 Lawrence Cervantes presents his second solo exhibition, ”Ascension to Light,” opening on March 23, Saturday, 6 o’clock in the evening at Galerie Stephanie, located on the 4/F East Wing, Shangri-La Plaza Mall, Mandaluyong City. In his sophomore effort, “Ascension to Light,” Lawrence transports his audience to a misty and melancholy swamp land populated with eerie otherworldly figures. Mostly female, some naked, but all with faces concealed; they present to us in various states – grappling amongst other bodies, posed provocatively, embracing, floating, hands clasped, reposed, and ascending. This is Lawrence’s perception of the spiritual ‘purgatory’ – a place or dimension where, after bodily death, imperfectly purified souls go to be thoroughly cleansed and ascend to heaven, or fall into hell. Popularized by Roman Catholicism, the belief in an intermediate state between death and the next life spans both human history and the globe. It can be found in Judaism’s ‘Gehenna,’ Chinese Buddhism, and Islam’s ‘Jahannam.’ Lawrence’s depiction of purgatory involves a gloomy marsh land where pure souls ready to ascend are enrobed in white, while the bodies of the evil spirits tempting the pure are fully exposed. Shielding the faces of most figures are massive flocks of birds, signifying freedom and free will; while the singular goat symbolizes the sacrifice required to attain purity. While, upon first glance, the 17 artworks in “Ascension to Light” may appear pessimistic and devoid of hope, Lawrence uses the muted palette and lack of facial features to humanize the concept of purgatory. By effacing identity, he universalizes this Catholic doctrine, while the limited color allows the titanium white of ascension to remain in focus. Ultimately, hope is ambiguous, as whether or not we ‘ascend’ depends upon our individual actions and decisions. A graduate of Fine Arts from the Bulacan State University, Lawrence Cervantes is one of a number of young artists from Bulacan making waves in the art scene. Under the guidance of longtime social realist Renato Habulan, Lawrence has joined 12 group exhibitions at Altro Mondo Arte Contemporanea, Ysobel Art Gallery, Cevio Art Haus, and at Galerie Stephanie since 2012. In 2018, he was one of the eight young artists awarded the Tuklas Residency Program, a yearlong mentorship program under artists Habulan and Alfredo Esquillo; culminating in his first solo exhibition “Winny Wanna Go to Heaven” at the Eskinita Art Gallery. Lawrence currently teaches part-time at the Bulacan State University.